Leading Distributor / Channel Partner of electric texture sprayer and plural component sprayer from Bengaluru. Electric Texture Sprayer machine where we can spray putty (both powder/acrylic), bubble texture, all textures, cementitious waterproofing. 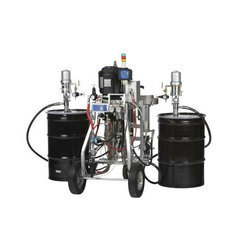 We are exclusively engaged with our expertise in supplying a wide assortment of Plural Component Sprayer that has high pressure for high solids coatings. The offered sprayer is great for applications where you want to spray with multiple guns & designed by vendor’s practiced professionals utilizing ultra-modern techniques in conformity with the quality standards. 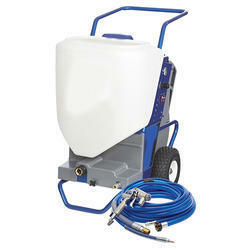 Our patrons can avail this sprayer from us in several specifications at the reasonable price within a given time frame. 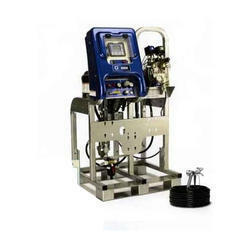 With the experience we have gained in this domain, we are engaged in offering a wide range of Plural Component Sprayer. Our offered sprayers are designed using the best quality material and the latest techniques at our well-establish unit. These sprayers are applauded among clientele for its optimum finishing. Along with that, the entire range of sprayers is available in numerous specifications. Looking for Plural Component Sprayers ?